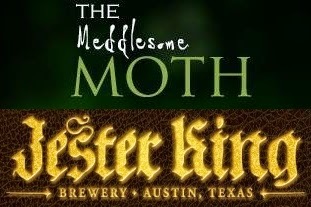 Continuing their series of anniversary pairdinés, the Meddlesome Moth has made public the menu and beer list for their Jester King Beer Breakfast, an event they say will be just as unorthodox as the brewery itself. Jester King founder Jeffrey Stuffings will host the get together, which happens on Saturday, April 4 at 10:30 a.m. Tickets are $65pp, including gratuity, and can be purchased on Eventbrite or by calling the Moth directly at 214-629-7900. Noble King - hoppy farmhouse ale. Snörkel - farmhouse ale brewed with oyster mushrooms and sea salt. Tamagoyaki, pork belly, bonito, nori and sea bean salad. Omniscience and Proselytism - barrel-aged sour beer refermented with strawberries. Foie gras, rhubarb croissant perdu, mascarpone pot de crème and plantain crisp. Figlet - farmhouse ale fermented with smoked Texas figs. House Texas pastrami biscuit, beef jerky marmalade and smoked pecans. La Vie en Rose - farmhouse ale refermented with raspberries. Paula's ricotta blintz with Paris tea jam.